Baxter International Inc. announced today it is voluntarily recalling one shipment from a single lot of INTRALIPID 20% IV Fat Emulsion, 100 mL, distributed between 8/11/17 and 8/31/17 to hospitals and healthcare providers in the United States, to the user level. Baxter International Inc. announced today it is voluntarily recalling one shipment from a single lot of INTRALIPID 20% IV Fat Emulsion, 100 mL, distributed between 8/11/17 and 8/31/17 to hospitals and healthcare providers in the United States, to the user level. The product has been exposed to subfreezing temperatures during transit to a distribution facility. The subfreezing temperature is outside of the acceptable storage range listed on the product labeling. Other shipments of this lot are not affected by this issue. If accidentally frozen, INTRALIPID 20% IV Fat Emulsion should not be used. When subjected to freezing, the emulsion droplets will increase in size, forming aggregates that can block pulmonary circulation and lead to serious adverse health consequences that can be life-threatening. To date, Baxter has not received any reports of associated adverse events or product complaints. 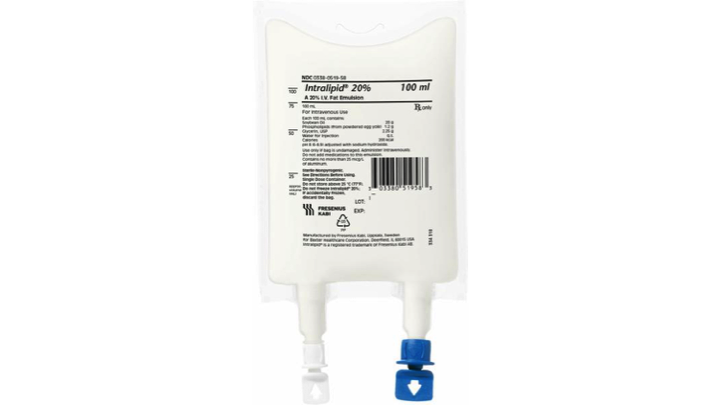 INTRALIPID 20% IV Fat Emulsion is a prescription product indicated as a source of calories and essential fatty acids for patients requiring parenteral nutrition for extended periods of times. The product is packaged in 100 mL bags. Baxter has informed customers affected by this particular shipment to locate and remove all affected product. Recalled product should be returned to Baxter for credit by contacting Baxter Healthcare Center for Service at 888-229-0001, Monday through Friday, between 7 a.m. and 6 p.m. Central Time. Customers with questions regarding this recall can contact Baxter Corporate Product Surveillance at 800-437-5176, Monday through Friday, between 8 a.m. and 5 p.m. Central Time. Consumers should contact their physician or healthcare provider if they have experienced any problems that may be related to using this product. Baxter is voluntarily conducting this recall with the knowledge of the U.S. Food and Drug Administration.